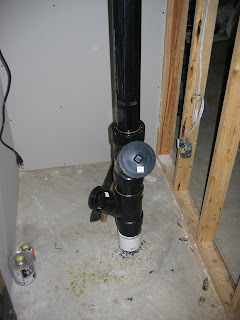 Way back before we poured the basement floor I installed the waste plumbing (see previous post1, post 2). I used PVC pipe (the white stuff) , primarily 4-inch pipe but also some 3-inch pipe. The process went great! Little did I know I was setting myself up for some headache! Then comes the time to install all the waste and vent pipe above the concrete floor. This is where I intended to use ABS pipe (the black stuff). At the time I knew that while the inside diameters (ID) were the same, the outside diameters (OD) were different. I naively assumed that there would be plenty of connectors that would span this change in size. Lesson Learned: Stick to one type of pipe!